WooCommerce Coupons Countdown is an extension for WooCommerce, that provides pretty coupons with real-time countdown counters. Install and activate the WooCommerce Coupons Countdown plugin. Duration : If a duration is indicated, a user may use the coupon only during the set period after registering. Duration UOM : The Unit Of Measurement for the duration: days, weeks, months or years. Usage limit per user : How many times this coupon can be used per user. Guests allowed : If this option is enabled, the coupon may also be used by guests. The usage limit is based on the customer’s billing email-address used. Duration : If a duration is indicated, a customer may use the coupon only during the set period after having placed the last order. For example, if a customer has placed her last order on the 20th of August and the duration is limited to 7 days, the customer may only use the coupon up to the 27th of August. If the customer places a new order on the 10th of September, the coupon may be used by the customer again until the 17th of September. The order must be processing or completed, otherwise the coupon will not be valid. Duration : If a duration is indicated, a user may use the coupon only up to so many days, weeks, months or years after last having ordered the products indicated. Only processing or completed orders are taken into account. The duration is optional, if no duration is given, the validity of the coupon is just based on products ordered. Products : One or more products should be indicated here to limit the coupon to customers who have purchased at least one of these. If a duration is given, the customer must have purchased at least one of the products within that time-frame. Minimum : This limits the validity of the coupon based on the number of units previously purchased. If set, the accumulated number of units purchased for any of the products indicated in the Products field, must be greater or equal to the minimum number indicated here. This restriction requires at least one product to be indicated and the coupon will be valid if the accumulated total of any of the products indicated is complying with the minimum. Maximum : Similar to the minimum, the accumulated maximum number of units purchased for any of the products indicated. To display a coupon, the [coupon_countdown] shortcode is used. Use the shortcode by embedding it on a page where you want to show certain coupons to your customers. 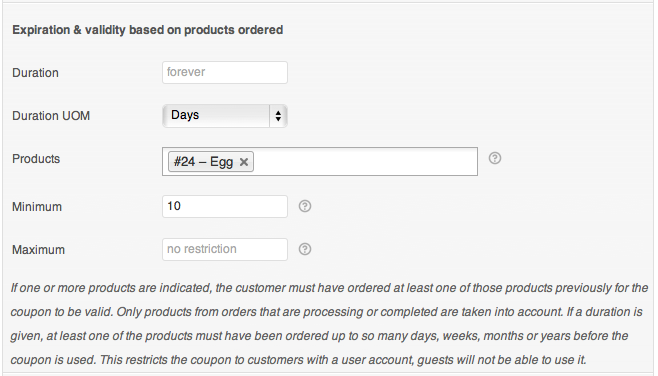 Coupons are displayed when valid (validity is based on the user account, coupon settings and the shortcode settings). Coupons with an expiration date will show a real-time countdown counter. code : (required) A coupon code or a comma-separated list of coupon codes – which coupon or coupons should be displayed. order_by : Defaults to none (renders coupons in the same order as given through the code attribute), also accepts codeand id. order : Defaults to ASC, also accepts DESC. pad : Default to true – use 0-padding on hours, minutes and seconds when value is below 10.
color : Which color to use for the coupon or coupons: red, green, blue or yellow. More specifically, color CSS class applied along with .coupon-countdown-container and .coupon-countdown, defaults to blue. stylesheet : An alternative stylesheet can be loaded, must be a valid URL pointing to the stylesheet. show_cart_invalid : Shows coupons that are not valid because a dependency in the cart is not met, true by default. show_invalid : Shows invalid coupons, false by default. 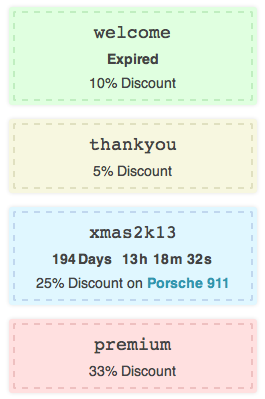 show_discount : By default, coupons show the type of discount. Use show_discount="no" to disable that. show_description : This option allows to show the coupon’s description. It is disabled by default. Indicate show_description="true" to enable it. Irrespective of show_cart_invalid and show_invalid, coupons with user registration expiration set will not be shown to guests.